Conçu en 1910 pour répondre aux besoins hygiéniques d’une ville en plein essor industriel, hanté par un code moral stricte, l’intérieur de la piscine Saint-Michel (anciennement Bain Turcot) sera définitivement altéré d’ici 2003. Le Centre de recherche urbaine de Montréal a invité douze artistes à mettre en valeur la spécificité architecturale du lieu. 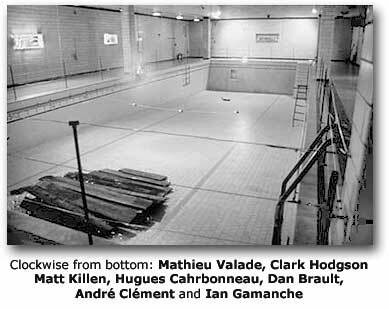 Since 1996, numerous exhibitions have taken place in the Piscine Saint-Michel, a former public bath situated in Montreal’s Mile-End district. Few of these exhibitions dealt specifically with the architectural structure of the bathhouse or were conceived on the premises. The Centre de recherche urbaine de Montréal organized the group exhibition Objet 01: Les derniers jours d’un bain public in order to explore the physical possibilities of the building, treating the site as a three-dimensional object instead of an exhibition space. Rather than installing existing works, the invited artists conceived interventions to emphasize the pre-existing sculptural qualities. The project began as a residency. The artists occupied the Piscine Saint-Michel for a period of four weeks, creating interventions in direct relation to the architecture, design, and the current physical state of the building (the presence of decay, materials left by previous occupants). Following this four-week period, the results were presented to the public for a period of two weeks. Dan Brault sought to bring out the more painterly qualities of the building, repainting the lines in the bottom of the pool in bright orange and creating coloured patterns in the gigantic round window on the southern wall of the building. Hugues Charbonneau presented a series of photographs that documented ephemeral installations in the Piscine Saint-Michel (these installations were made in collaboration with Matt Killen during the residency and were presented photographically for the exhibition). 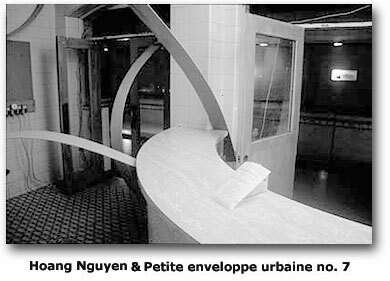 Hugues Charbonneau’s principal project is the Petite enveloppe urbaine; he co-ordinated a special edition of this publication/artist’s book for Objet 01. André Clément presented a large-format digital print in which the image of the main room of the bathhouse was fused with that of a section of the facade of the building. Nicolas Fleming constructed monolithic wooden structures covered in high-gloss industrial paint in the shower stalls of the building. 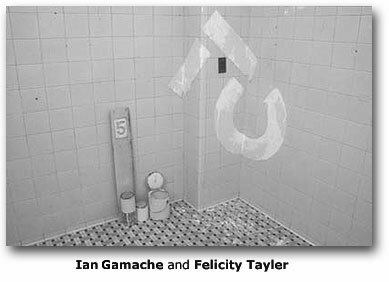 Ian Gamache worked with objects and photographs found in the basement of the building and in the surrounding streets, incorporating them into installations and artist’s books. Clark Hodgson presented photos taken in the space, mounted on light boxes constructed from found objects. Matt Killen presented photo-collages of the basement, a section of the building inaccessible to the public, and a sound installation. The latter was a recorded exploration of the acoustics of the building played back in the same space, creating further resonance. Hoang Nguyen installed curved wooden forms that echoed the shape of the counter in the front entrance; these forms seemed to be coming out of walls, the floor, the ceiling, and the counter itself. 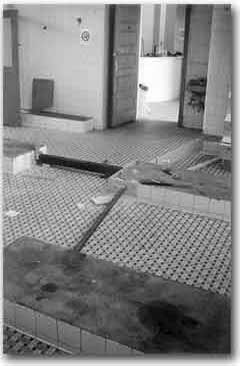 Doug Scholes’ intervention was particularly subtle and consisted of replacing broken tiles in the former locker-room (a particularly futile action, as the interior of the building will be totally renovated). Felicity Tayler painted a large number five in the corner of one of the rooms, using paint found on the premises. All measurements in the building (the length and depth of the pool, etc.) are displayed in increments of five. Carl Trahan explored the formal qualities of the former locker room, delineating where many of the objects existed in its previous incarnation with blue and pink chalk lines, representing its mixed-gender utilisation. Mathieu Valade’s project evolved over the course of the residency. He began by exploring the pool’s former function as a large container for water, precariously piling glasses of water on shelves made of rotten wood in an arrangement that mimicked the shape of the round window. As the structure slowly collapsed, he continued to manipulate his installation, arranging the collapsed sections and sweeping the broken glass again into a circular form. The installation exhibited was thus the result of a lengthy and calculated process. As the Piscine Saint-Michel will soon no longer be at the disposal of artists, the intention of this exhibition was to conceive an intervention which would explore the aesthetics of the building, its architecture, and its current physical state. The project was initiated by Matt Killen and presented by the Centre de recherche urbaine de Montréal (CRUM). Since its foundation in 2000, the CRUM’s activities have consisted primarily in the production of publications (Petite enveloppe urbaine). Objet 01 is the first of what is hoped to be a series of site-specific exhibitions. The CRUM’s principal interest is in the exploration of the relationship between the artistic practices of emerging artists and the urban space of Montreal. 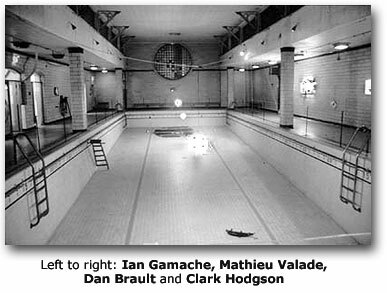 The nearly century-old Piscine St-Michel, (5300 St-Dominique), a bathhouse in the industrial district east of St-Laurent and north of Laurier, has in the past few years been used for reasons more artistic than hygienic, hosting many the exhibition and performance. As of next year, the space will undergo another permutation, as it will be renovated into a rehearsal space for a local dance company. As a sort of adieu, the Centre de recherche urbaine de Montréal has enlisted 12 artists to create Objet 01: Les derniers jours d’un bain public, an exhibit of works that each interact intimately with the architectural structure of the bathhouse. The artists—who include Carl Trahan, Matt Killen, La Petite enveloppe urbaine, and André Clément—have spent four weeks in the place, working with photography, sculpture, painting and other media. Their “interventions,” as they’re called, will be on display from April 26 (with a vernissage at 7 p.m.), through May 11. This entry was posted on	April 26, 2002 at 1:37 am	and is filed under CRUM Projects.